Retreat into luxurious town and country living with a tour of historic royal residences in London, the Oxford countryside, and England’s ancient capital of Winchester. Experience the privilege, grace, and power felt by centuries of England’s upper crust with visits to formidable castles, stately homes, gardens, cathedrals, and museums, with exclusive, in-depth walking tours. Learn how architecture and lifestyle evolved at England’s great estates, beginning with tours of the Tower of London and the Henry VIII’s pleasure palace at Hampton Court and ending at Blenheim Palace near Oxford, the birthplace of Sir Winston Churchill. Channel your inner gentility with a leisurely stroll through idyllic Cotswold villages; visit the ancient home of England’s earliest kings; and immerse yourself in the splendor of noble palaces and formidable fortresses. We go behind the scenes at many historic attractions, stay at lodging of historic note, enjoy some of England’s best locally-produced food, meet artisan food producers, and rub elbows with locals during pub meals. Settle into our London hotel with a welcome cocktail followed by a guided tour of the Museum of London, with an emphasis on the medieval and Renaissance collections. We’ll toast to our tour during an early group dinner. Explore Tudor London on an exclusive private, guided tour led by scholars from our National Geographic & Conde Nast endorsed partner, Context Travel. The Tudor dynasty is put into historical context with visits to the National Gallery, Westminster Abbey and the Tower of London, where you have free time to explore. Fill up on pub classics during lunch and end the day together sharing a lively dinner and a few pints. Dig deep into royal lifestyle with an exclusive, private guided tour with historians of Henry VIII’s pleasure Palace at Hampton Court. From there, we sojourn to England’s ancient capital of Winchester, stopping along the way to experience one of the best examples of early Tudor architecture- The Vyne, frequented by Henry VIII and Anne Boleyn. We arrange for you to take your own private picnic in the gardens (weather permitting) or lunch in the Tudor tearoom, then onward to Winchester for two nights where we end the day with a casual dinner together at a historic pub. Spend the day exploring England’s ancient capital of Winchester- home to the country’s early Saxon Kings, most famously Alfred the Great. Today, the city boasts Europe’s longest cathedral, the reputed “Round table” of King Arthur, and plenty of museums, shops, and pubs. Spend the morning with our expert on a guided tour of Winchester’s cultural treasures, culminating in a wonderful lunch drawing on rural resources and nearby farm fare. Continue on an optional guided tour looking deeper into the Winchester’s royal and religious history or strike off on your own for the rest of the afternoon. Dinner is at your leisure. After breakfast, we are driven through some of England’s most sacred and beautiful countryside to spend the morning touring the Cotswolds. Stroll through a few villages with charming thatch-roofed homes, quintessential English gardens and bustling markets, then share a specially-made local, seasonal lunch. We make our way into the heart of Oxfordshire, where we spend four nights in the university town of Oxford. After a leisurely walking orientation, we share dinner at a wonderful restaurant. In the morning, we explore England’s ‘beacon of learning’ with its dreamy spires and covered market during an in-depth walking tour of this historic and academic city. After lunch on your own, spend the afternoon at your leisure visiting the university and Henry VIII’s Christ Church where many scenes from Harry Potter were filmed or wander the extraordinary collections of the Ashmolean- the world’s oldest Museum. We are happy to coordinate a private tour of any aspect of Oxford in which you are interested. We reconvene for dinner together at an Oxford instituition. Today, our driver transports us north into Warwickshire, the lands of “The Kingmaker.” English Heritage historians guide us through Kenilworth Castle and its gardens, home of Queen Elizabeth I’s favorite, Robert Dudley. After free time and lunch together, we visit Warwick’s formidable fortress. 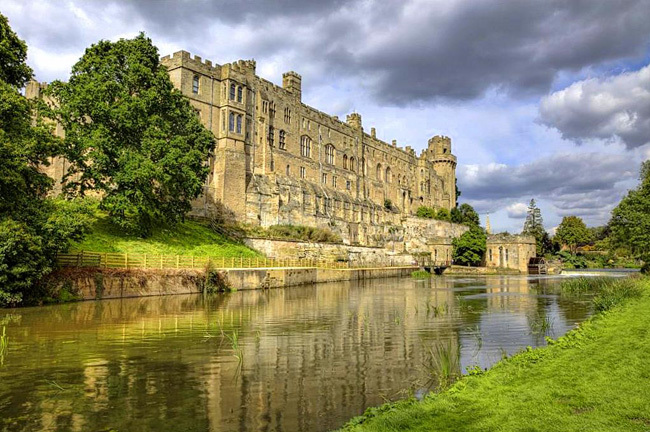 We learn the storied background of the castle, once home of the powerful Earls of Warwick, and why it was pivotal in the War of the Roses. Gawk at world class armor and weaponry in the great hall, see the original 11th century tower, and stroll the waterfront Mill gardens or Temple Gardens, named for the once-fields belonging to the Knights Templar. We’ll share a unique dinner experience together back in Oxford. Today, we visit two magnificent country estates. First stop: Waddesdon Manor – the French renaissance-style château built by Baron Ferdinand de Rothschild to display his outstanding collection of 18th century French art followed by yet another fabulous country lunch and drinks. Then it’s off to one of England’s largest palaces- Blenheim Palace, the birthplace of Sir Winston Churchill and home of the Dukes of Marlborough. Enjoy dinner on your own in our last night near Oxford..